As the power requirements for microelectronics continue decreasing, environmental energy sources can begin to replace batteries in certain wearable subsystems. In this spirit, this effort has examined devices that can be built into a shoe, (where excess energy is readily harvested) and used for generating electrical power "parasitically" while walking. Two of these are piezoelectric in nature: a unimorph strip made from piezoceramic composite material and a stave made from a multilayer laminate of PVDF foil. 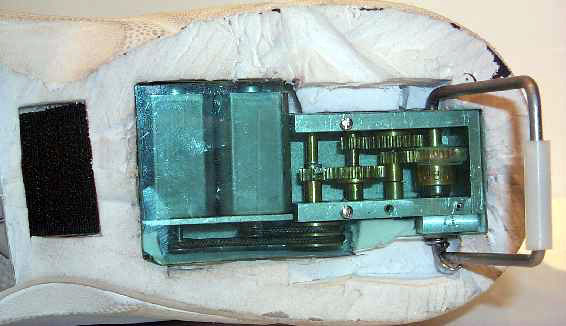 The third is a shoe-mounted rotary magnetic generator, an early version of which is currently exhibited at the London Museum of Science and Industry. 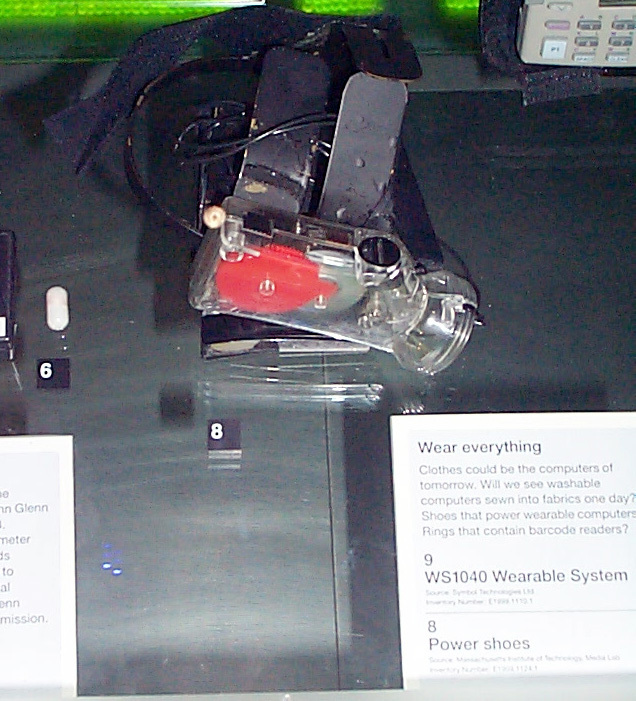 As a self-powered application example, a system had been built around the piezoelectric shoes that periodically broadcasts a 12-bit digital RFID as the bearer walks. Here is a full video demonstration (12 meg) of the piezoelectric shoes powering the wireless ID transmission. These shoes produce peak powers on the order of 100 mW, and average powers of 10 mW. All elements are innocuously buried in the insole. Here is a video demonstration (4.2 meg) of the magnetic-generator shoe actually powering a portable radio as the bearer walks. As indicated above, it's not very easy to walk with, especially in comparison with the piezoelectric system, although the power (a quarter of a Watt, average) is much higher. Systems for Human-Powered Mobile Computing, Paradiso, J.A., in the Proc. of the IEEE Design Automation Conference (DAC2006), San Francisco, CA, July 24-26, 2006, pp. 645-650. Energy Scavenging for Mobile and Wireless Electronics, Paradiso, J.A. and Starner, T., IEEE Pervasive Computing, Vol. 4, No. 1, February 2005, pp. 18-27. Human Generated Power for Mobile Electronics, Starner, T. and Paradiso, J.A., in Piguet, C. (ed), Low-Power Electronics, CRC Press, Chapter 45, 2004, pp. 45-1 - 45-35. "Energy Scavenging with Shoe-Mounted Piezoelectrics," Nathan S. Shenck, Joseph A. Paradiso. IEEE Micro, Vol. 21, No. 3, May-June 2001, pp. 30-42. "Parasitic Power Harvesting in Shoes," John Kymisis, Clyde Kendall, Joseph Paradiso, and Neil Gershenfeld. Proc. of the Second IEEE International Conference on Wearable Computing, (ISWC), IEEE Computer Society Press, pp. 132-139, October 1998. "Renewable Energy Sources for the Future of Mobile and Embedded Computing," J. Paradiso, Invited talk given at the Computing Continuum Conference, San Francisco, CA, March 16, 2000. Jeffrey Y. Hayashida-- "Unobtrusive Integration of Magnetic Generator Systems into Common Footwear," BS Thesis, MIT Mech. Eng. Department and MIT Media Lab, June 2000. Nathan S. Shenck -- "A Demonstration of Useful Electric Energy Generation from Piezoceramics in a Shoe," MS Thesis, MIT EECS Department and MIT Media Lab, May 1999. Clyde Jake Kendall-- Parasitic Power Collection in Shoe-Mounted Devices," BS Thesis, MIT Physics Dept. and MIT Media Lab, June 1998.